GrowInStyle's Organic Daisy Delight will dazzle any new parent. 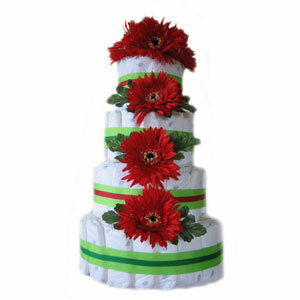 This diaper cake is made with 4 layers of Eco Friendly Nature BabyCare Diapers and decorated with beautiful silk red daisy's. Use this attractive diaper cake as a baby shower centerpiece or give as a baby gift to a new mom. Our 4 Tier Eco Friendly Diaper Cake is constructed with approximately 90 Nature BabyCare Eco Friendly Diapers (size 1). We take special care to assure that all diapers will be 100% usable by the new mommy.